Universal City, California – A journalist in Iran endures an unthinkable ordeal when he is falsely accused of spying in Rosewater , a political thriller coming to Digital HD, Blu-ray™ Combo Pack, DVD and On Demand on February 10, 2015, from Universal Studios Home Entertainment. Based on the thrilling true-life story of Maziar Bahari, the film features first-rate performances from an international cast, as well as an impassioned script that infuses wit and humor into a terrifying and all-too-real situation. 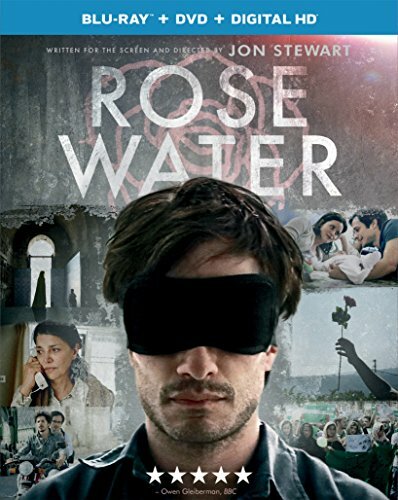 Available on DVD and Blu-ray™ Combo Pack, Rosewater comes with bonus content that sheds additional light on this important story. Rosewater marks the feature-film writing and directing debut of comedian and political "The Daily Show" host Jon Stewart. Gael García Bernal (Cesar Chavez, The Loneliest Planet) stars as Baziar, turning in a performance described as "exceptional" by Peter Travers of Rolling Stone, along with Oscar®nominee Shohreh Aghdashloo (On the Inside, The Odd Life of Timothy Green). Rosewater has earned the prestigious Freedom of Expression Award from the National Board of Review, as well praise from critics including Sasha Stone of Awards Daily who says "It's not only one of the best films I've seen this year, but one I will keep telling people to see." Based on Then They Came For Me: A Family's Story Of Love, Captivity, and Survival, the best-selling memoir by Maziar Bahari and Aimee Molloy, Rosewater follows the Tehran-born, Canada-based Bahari as the journalist returns to Iran to interview Mir-Hossein Mousavi, challenger to Mahmoud Ahmadinejad in the country's contentious 2009 presidential election. As Mousavi's supporters were protesting Ahmadinejad's victory declaration even before the polls closed, Bahari endured personal risk by sending footage of the street riots to the BBC. For this, Bahari was arrested by police led by a man known only as "Rosewater." He was tortured and interrogated over the next 118 days, while his wife embarked on an international campaign to have her husband freed and media outlets kept the story alive. * Blu-ray™ unleashes the power of your HDTV and is the best way to watch movies at home, featuring 6X the picture resolution of DVD, exclusive extras and theater-quality surround sound. * DIGITAL HD with UltraViolet™ lets fans watch movies anywhere on their favorite devices. Users can instantly stream or download. Rating: R for language including some crude references, and violent content.